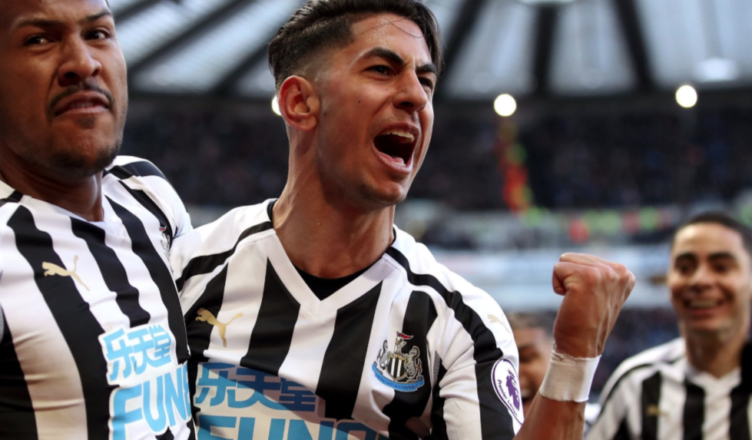 Brilliant new Ayoze Perez stats emerge – This will silence a few more of his doubters.. – NUFC blog – Newcastle United blog – NUFC Fixtures, News and Forum. Brilliant new Ayoze Perez stats emerge – This will silence a few more of his doubters..
As revealed by The Times, no Premier League forward has completed more interceptions and ball recoveries than Ayoze Perez over the 2018/19 season. Not only that, their piece reveals that the only FIVE fellow Premier League attackers have created more chances than him this season (Hazard, Willian, Salah, Sterling and Zaha). This comes following his electric second half display in the 3-2 win over Everton, with several fans believing he’s now done more than enough to keep any of his doubters quiet at St James’ Park. Don’t get me wrong, a string of good performances does not change the fact Ayoze’s form was incredibly frustrating earlier on in the season, but the numbers don’t lie – both from an attacking and defensive perspective. His work rate and defensive intelligence shouldn’t be in question – even if he sometimes does go down a little easily or seem too weak at times – and the fact he’s managed 17 goals and 8 assists as number 10 in a low scoring Premier League side over the last two seasons shouldn’t be sniffed at either. Is he suddenly a world beater? No. But he’s come up trumps at the business of the last THREE seasons. He must be much more consistent, and the challenge now will be for him to produce over an entire season, but it’s perhaps time a few of his haters got off his back and accepted that he actually does a very decent job in Rafa’s side. Mike Ashley spotted out with Premier League star, Dennis Wise & Alan Shearer lookalike – Bizarre..
Dont know about haters but people are entitled to have their opinion. I for one am over the moon to see his form this year and especially since almiron and the change in tactics. Long may it continue. Equally in the first half of the season I thought he was too easily knocked off the ball and looking for non existent fouls and his head went down. I do hope this will silence the doubters, even when he has an off game it’s not for lack of trying. Sadly Ashley will look at him as a £50M+ asset now. I think Almiron is the difference he has made everybody better. It may be that he has defences worried about him then it opens up for others. One thing I love about Perez is that he never hides even on an off day. These are amazing stats and yes he needs to takes his fingers out of his ears and listen to those of us who appreciate what he does.